Until fairly recently, all I knew about the Dust Bowl was a general outline. 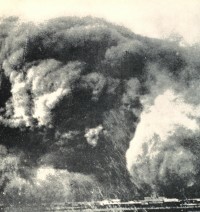 I knew that a combination of overfarming, drought and wind had caused massive dust storms through the Plains states of Kansas, Texas, Oklahoma, Colorado and New Mexico during the 1930s. I had seen pictures of displaced farming families taken by Farm Security Administration photographers like Dorothea Lange and Walker Evans. I had read The Grapes of Wrath. But I had no concept of the full scale of the calamity until I saw a History Channel program called Black Blizzard (view a short clip here, DVD for sale here) two years ago. It was a revelation to find out that the amount of topsoil displaced during the decade could fill the Grand Canyon, that dirt which had once supported amber fields of grain was blown so far that it blanketed Chicago, Washington, D.C. and New York City before landing in the Atlantic Ocean, that it was impossible to keep the talcum-like dust out of the house no matter how many wet sheets were stuck to the walls, that people and animals caught in storms died of suffocation, that the gradual buildup of dust in the lungs caused dust pneumonia which was even deadlier, especially for children and the elderly who died in misery, coughing up mud. Then there were the grasshoppers and hares who descended Old Testament-style upon any plant material that managed to survive the widespread erosion, drought and wind storms. It was a decade of hell on earth and it was entirely man-made. Before the Civil War, the Great Plains area was known as the “Great American Desert.” Rainfall was scarce and cyclical. The native grasses with their deep roots and moisture retention capabilities thrived in the region’s semi-arid climate, but crops would not. As white settlers increasingly moved west of the Missouri after the Civil War, they bumped into a wet cycle. Hack climatologists decided that the increase in rainfall was a result of the increase in settlement, that “rain follows the plow” and that therefore the Great American Desert was now a lush fertile land to be farmed at will. The government espoused this theory and actively encouraged settlement and farming, with no attention paid to even the most basic good farming practices like crop rotation and terracing. With the increase in immigration in the early 1900s, more and more settlers claimed a homestead in the Great Plains. The prime farming land near rivers that could be irrigated was already taken, and the government specifically encouraged farming of the prairies in the Enlarged Homestead Act of 1909 which doubled the size of land grants to 320 acres per farmer to make up for the lack of water resources. 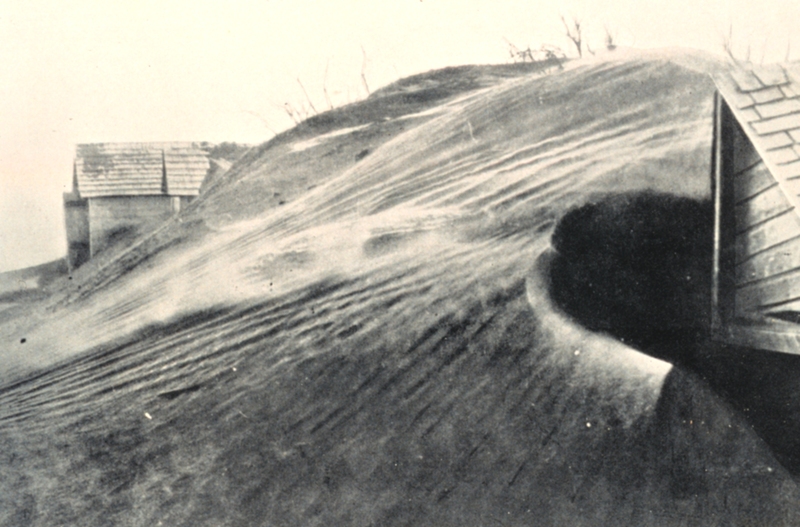 Using deep plough techniques which eradicated the native grasses and exposed the topsoil to the winds, farmers planted thousands of acres of single cash crops like wheat and cotton. High prices during World War I and another wet cycle in the 1920s encouraged ever more extensive ploughing and planting. Prices dropped drastically after the Wall Street Crash in 1929, but that only gave farmers more incentive to plant as much as they possibly could to make up for the shortfall. When the wet cycle ended and drought began in 1930, the land which had been so dramatically altered by farmers over the preceding decades literally threw itself in their faces. Those deep furrows ploughed into the topsoil exposed it to the winds. Without water or grasses to keep it in place, the dirt was simply swept away, sometimes creating massive rolling clouds that for days blanketed everything in their path with dust and grew so huge they blocked out the sun. Some farmers tried to tough it out hoping next season the rain would fall again, but as the years went on and conditions only got worse, by 1935 many lost their homes to the banks and were forced to move, seeking out employment as migrant workers. A total of 2.5 million people moved out of the Plains states between 1930 and 1940. Many of them wound up in California and the Pacific Northwest. 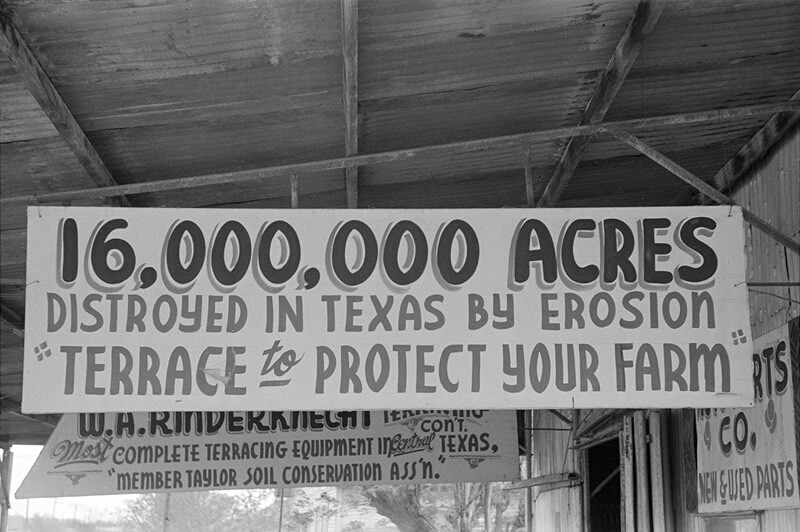 As soon as Franklin Roosevelt took office, his administration initiated programs to conserve soil, encourage anti-erosion farming practices (even as late as 1937 the government literally had to pay farmers to utilize crop rotation or terracing or contour ploughing), plant a shelterbelt of 200 million trees from Texas to Canada to break the wind and keep the soil in place, distribute canned foods to help the needy, and purchase drought-stricken cattle from ranchers so the strongest animals had access to more resources. By the end of the decade, these programs helped significantly reduce the amount of blowing soil. In the autumn of 1939, rain fell again. In standard History Channel fashion, the show I saw two years ago was packed with CGI and reenactments for which I have a limited tolerance, but it also featured survivors of the Dust Bowl telling their stories for which I have an unlimited hunger. Although I didn’t know it at the time, by the time I watched that program, Ken Burns and his team had been working for a year on collecting oral histories for his own documentary on the Dust Bowl. 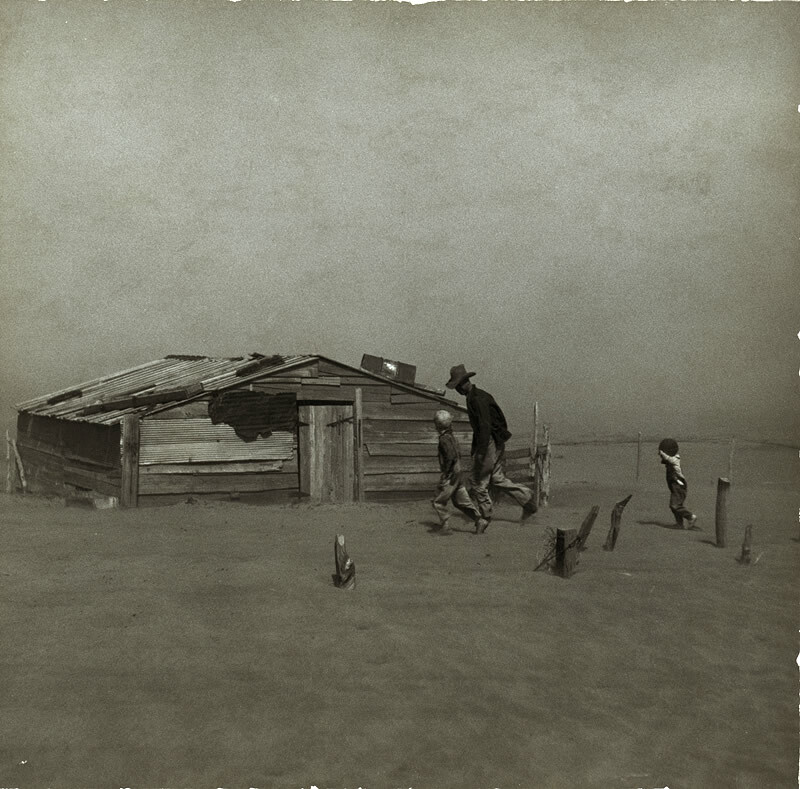 Realizing that time was short if they wanted to record the memories of people who lived through the hellish period, in 2009 Burns made a direct plea on PBS asking people for their stories, pictures and film of life in the Dust Bowl. His team scoured the Plains states, putting ads in local newspapers, visiting senior centers, looking for people who could convey the compelling stories of their dirt-besieged youths. They were successful. The oral histories are the focus of this documentary. No cheesy re-enactments, no low-rent CGI. Just real people who went through hell and lived to tell the tale. Also playing a starring role are the pictures taken by the immensely talented photographers of the Farm Security Administration and period films shot by professionals and amateurs. Ken Burns’ The Dust Bowl debuts Sunday, November 18th at 8:00 PM on your local PBS station, followed by episode two on Monday night. 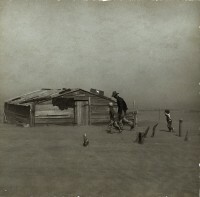 The website has an excellent collection of Dust Bowl photographs, clips and other videos about the documentary, and biographies of the survivors featured. This video about the eye witnesses is my favorite. This entry was posted on Saturday, November 17th, 2012 at 1:15 PM	and is filed under Modern(ish), Multimedia. You can follow any responses to this entry through the RSS 2.0 feed. You can skip to the end and leave a response. Pinging is currently not allowed. After Ken Burns was exposed for his very lopsided and error filled documentary on the Shakers, I have little faith in his ability to give an accurate and impartial account of history any more. I prefer to assess works on a case by case basis. His documentary on the Shakers was not much of an oral history. In this case, as in his excellent series on World War II, you can easily ignore whatever directorial editorializing that might trouble you and focus on the survivor testimonies. My Mother and Father bought a new TV with the Dust Bowl film in mind. They both have stories about the dust when they were tikes. You should interview them! It’s important to get these stories recorded asap. I interviewed my parents this spring to get a general history of their lives and it was truly illuminating. I love this quote below. Completely unlike the “expert climatologists” that have now decided the increase in temperatures is a result of the increase in greenhouse gasses and the government that is espousing this theory now…or is the irony completely lost on the global warming Cotton Mathers of our day? It’s not just climatologists today who suggest there’s an anthropogenic element to the increase in temperatures. There are plenty of other scientific disciplines examining the issue and coming to similar conclusions. There’s also evidence and methodological rigor that makes any comparisons with the fantasy conjectures of the turn of the century more a function of political rhetoric than of sober assessment.